March 2016 marks 5 years since room-temperature superconductivity was first achieved. However, this anniversary is bittersweet, as the scientific community persistently refuses to vet or even investigate the 35 RT compounds discovered so far by Superconductors.ORG. The word "science" comes from the Latin word "scire", meaning to know. So why don't scientists want to know if these compounds are really superconductive at room temperature? This unwillingness to examine overwhelming evidence in support of RTSC is troubling. It suggests there is a double standard being applied to scientific investigation. For example, the recent signals uncovered by LIGO researchers confirming gravitational waves had a signal-to-noise ratio no greater than the data plots that support room-temperature superconductivity. Yet, the LIGO signals were immediately accepted as confirmation. This can be seen by comparing the below LIGO graphics with the RTSC plots on this page. Furthermore, if the mechanisms that made possible 35 RT superconductors are indeed valid, then additional discoveries should continue to be made. And they do continue. 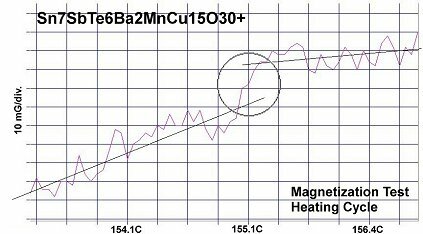 Today Superconductors.ORG announces two new superconductivity records: The compound Sn7SbTe6Ba2MnCu15O30+ has been found to produce both diamagnetic and resistive transitions near 155 Celsius (311F/428K). And its progenitor compound Sn7Te7Ba2MnCu15O30+ shows an even higher transition near 158 Celsius (316F/431K). The target structure for both materials is R212 as shown in the graphic below left. 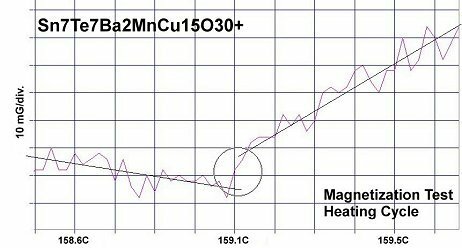 Two magnetization plots of the parent compound are shown at page top with unambiguous Meissner transitions of 12-15 milliGauss appearing near 158 Celsius. These were evident in over a dozen tests. The straight lines drawn through the noise represent the average of the data points, skewing apart at Tc. 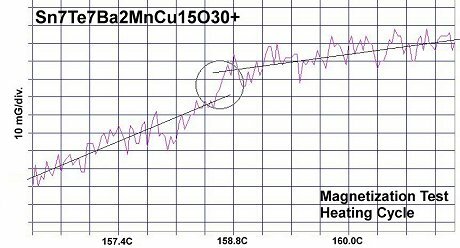 Below are magnetization plots of Sn7SbTe6Ba2MnCu15O30+, showing Meissner transitions near 155C. (Down is more diamagnetic and up is more magnetic.) Again they are strong and consistent. In addition to sharp Meissner transitions, most of the plots also displayed a slope change in the bulk magnetism-v-warming rate. Although it has a small volume-fraction (< 1%), the superconductor impacts the non-superconductive bulk collaterally. The parent compound Sn7Te7Ba2MnCu15O30+ was synthesized first, but had a bulk resistance above 100 MegOhms. Since a measurable resistance is required to observe a minority-phase transition, it was not possible to test that material resistively. Through subsequent reformulation one atom of antimony was substituted into one tellurium atomic site and the resistance then dropped below 40 MegOhms. 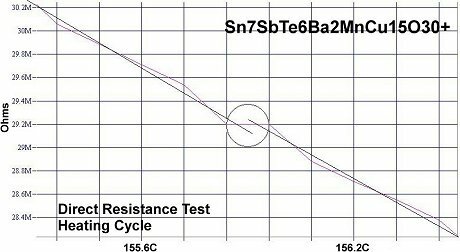 This allowed resistance tests to be performed, albeit with a loss in Tc of about 3 degrees (C/K) due to the reduced dielectric constant (K). SnTe has a Kappa of 1770. But SnSb is only 147. 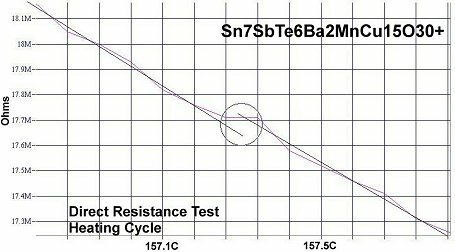 Two direct resistance tests are shown below. The exceptionally high transition temperatures of these materials comes despite being severely over-doped with electrons in the cation layers. This underscores the profound influence that dielectric constant has among the variables that determine Tc. Both test pellets were sufficiently hard to allow for the bonding of leads with silver epoxy. Both test samples showed a multi-phasic response. So the strongest transition was deemed to be the stoichiometric phase. All of the resistive transitions were below 160C. 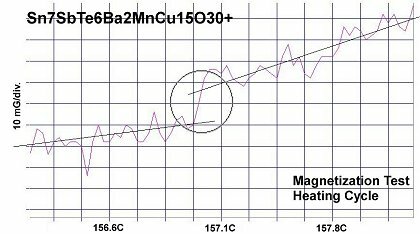 But the magnetization tests produced one small step above 160C, indicating there may be an unidentified minority phase with a higher Tc. 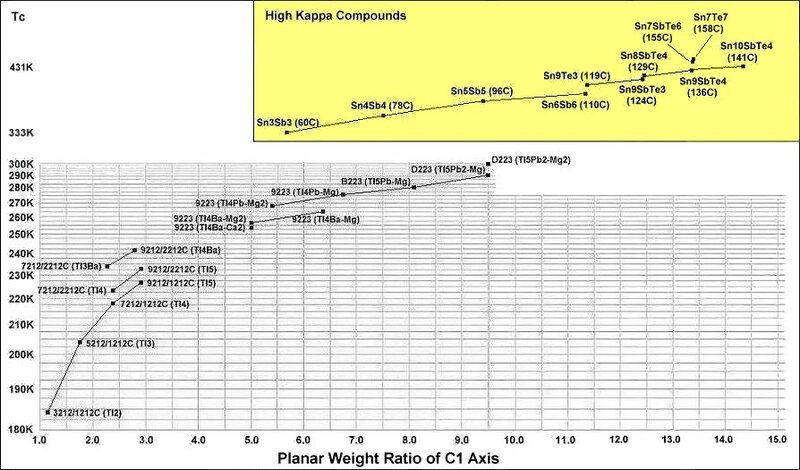 The dots within the below grid illustrate how Tc has advanced in the copper-oxides through correspondingly higher planar weight ratios and higher Kappas. 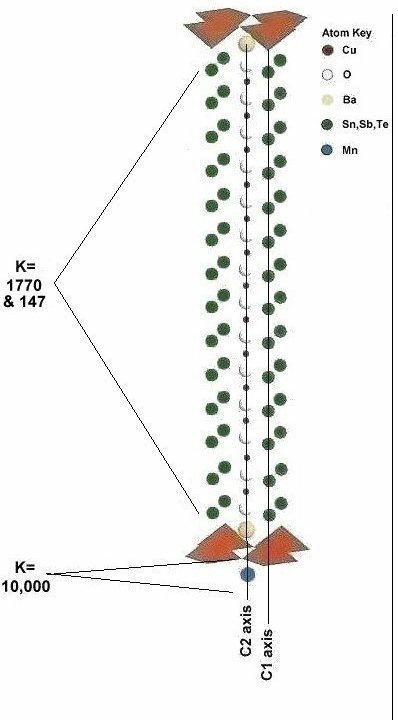 As a result of the higher Kappas, these two record materials actually have a planar weight ratio lower than the 141C superconductor that previously held the world record. In order to maximize formation of the R212 structure, these compounds were synthesized using the layer cake method, as shown below. The pellet had approximately 100 interference layers. And, even using this layering technique, the volume fraction is low, requiring very sensitive test equipment. The chemical precursors were pelletized at 60,000 PSI and pre-sintered for 1 hour at 715C. The pellet was then sintered for 10 hours at 880C and annealed for 10+ hours at 500C in flowing O2. Temperature was determined using an Omega type "T" thermocouple and precision OP77 DC amplifier. The magnetometer employed twin Honeywell SS94A1F Hall-effect sensors with a tandem sensitivity of 50 mv/Gauss. 1. Graphics courtesy Caltech, MIT, LIGO Lab. 2. Testing temperatures are believed accurate within ± 0.5 degrees C.
3. Dielectric constants were obtained from H. P. R. Frederikse, CRC Handbook of Chemistry and Physics.